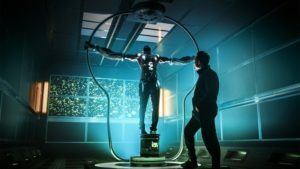 Shadow spends most of this episode of American Gods being tortured for information, leading to flashbacks of his childhood and the death of his mother. The flashbacks tackle his arrival in America and the struggles he endures as a mixed-race boy in a rough neighborhood where he is neither black enough for his neighbors and yet is still considered black by the police. His mother is his driving force and she starts out as a truly vibrant character which made her fading away due to illness all the more tragic. The most interesting part of the episode was watching the strange dynamic of Mad Sweeney and Laura Moon, as Laura is determined to pursue and rescue Shadow while Sweeney claims he’s just along for the ride until he can regain his lucky coin. But it’s becoming clear that he has developed some fondness for his corpse companion and he’s willing to support her in her mission for as long as it takes. On a parallel road trip are Mr. Wednesday and Mr. Nancy and they end up following Shadow’s tracks as well. Here’s another intriguing pair and there’s even a fun moment when Nancy complains about Wednesday’s racist choice of food and then proceeds to toss a whole bucket of fried chicken out the window. Something about this really reminds me of Green Book. 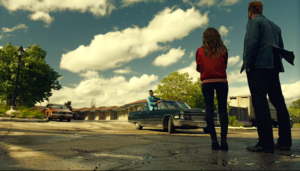 The episode as a whole plays out very slowly and, as others have pointed out, the style of this new season of American Gods is a little less nuanced than it used to be and so the flashbacks are slow but don’t really offer much substance. It’s good to get to know Shadow a little bit more and his position as he is being tortured is not subtle at all when it comes to religious imagery but still, there’s something missing about this season so far. Given the news that American Gods has been renewed for a third season but with another new showrunner, I’m getting slightly worried about the changes in style and execution that will continue to happen on the show. There’s a chance, of course, that it will change for the better, but the lack of continuity in leadership and vision will always be a major concern. The season premiere was an eventful affair so it seems strange to slow down so soon into the season but that’s what we got. There were some action-packed scenes at the end when Laura and Sweeney stormed into the train and Mr. Wednesday sacrificed a perfectly good automobile and sent it to Valhalla. So it ended with a boom, and hopefully next week, we see something more exciting.